Following the example of my dad, I have never tried to impose any of my tastes on my own children. He worked on the basis that you can lead a horse to culture but you can’t make it think (apologies to Dorothy Parker). His maxim was leave them alone and they will eventually come around to your way of thinking. I came around to some things slower than others: I was an adult before I realised how good all those thirties and forties songs he played were, but I was only six when I asked him if I could come too when he disappeared off to football every fortnight. And so it was that, just after my seventh birthday, I experienced the thrill of that first walk through the turnstiles of a football ground and the first sight of the lush, verdant pitch. It has been the same with my own sons: glimpses of televised matches, player sticker albums and my occasional trips to matches have all roused their curiosity and, aged seven and eight, for a while now they have been asking to go to a game. I could have taken them to an all-seated, multi-tiered amphitheatre of dreams named after a global corporation but I could not afford to and I did not want to; so instead, I took them to the Dripping Pan. 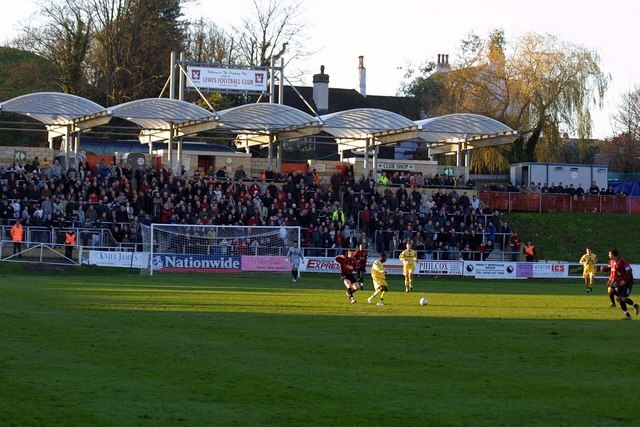 In the centre of town, a short stroll from the railway station, the Dripping Pan has been the home of Lewes Football Club – the Rooks - since its foundation in 1885. The name of the ground is believed to refer to the practice of extracting salt from River Ouse water by Cluniac monks on the site. However, behind the west terrace is the Mount, the possible site of a fortress built prior to Lewes castle, and it may be that the shape of the Dripping Pan – steep banks to all sides and the pitch below ground level – is simply because this was the excavation for the Mount. Whatever its origins, it is a natural stadium and has steep terraces at either end - one of them covered – and a stand on the south side. Only the north side has an undeveloped grass bank remaining but you can watch the match from the path at the top for that classic, ‘televised’ vantage point. We stood in the covered home end to take in the view of the Downs in the distance and best soak up the atmosphere of a Ryman Premier League clash against Hendon. Having paid only £10 for me to get in - kids under 16 go free at Lewes - we had enough cash for the boys to enjoy pre-match sausages in a bap and chips from the food stall. I had a cup of tea – “help yourself to milk and sugar on the table” – before I had the obligatory pint of Harvey’s. The small knot of Hendon supporters were enjoying the local brew as well and were in full voice when they took the lead after 15 minutes; but the atmosphere was never unpleasant and when Lewes scored three goals in five minutes straight after half-time it was the home fans who were making all the noise. As well as standing up on a terrace, there was another aspect of the day that was a reminder of my earliest days of watching professional football: at half-time quite a few supporters swapped ends to be behind the goal their team was kicking into. There was an incredibly friendly atmosphere: supporters all seemed to know each other and I had no concerns that the boys were at pitch-level at the front of the terrace and I was standing at the back. They got particularly excited every time Lewes scored and came racing back up to dance around at the back in celebration. Despite Hendon pulling a goal back to make it 3-2 as four minutes of added time started, Lewes held on for the win and moved level on points with Hendon one place outside the play-off places. Lewes played some good football with Harry Harding and Peter Gregory standing out for the Rooks. Lewes has been a community football club since 2010. As a not-for-profit, mutual organisation the club is owned and run by its shareholders, none of whom can own more than one share. Shares cost a minimum of £30 per annum or £1,000 for life. Shareholders can all stand and vote in elections to the seven-strong Board of Directors. The attendance of 648 at today’s game would indicate that pretty much everyone who is a member watches the matches. My £30 quid is in the post and I will be back with the boys on Easter Monday for a Sussex derby with Hastings United.